La-Z-Boy Furniture Gallery concept will be launching august/September 2017, with retailers stocking at least 20 seats of the new Originals Collection. Re-introduced to the collection the patented La-Z-Boy handle recline mechanism. Lazy boy Gallery point of sale material will include a four-sided totem featuring hanging leather swatches and a screen with brand video, freestanding screens and wall graphics. More than 70 retailers throughout the UK and Ireland will be branded as a La-Z-Boy Furniture Gallery, with the largest at Furnimax Furniture Megastore in Accrington. The La-Z-Boy gallery at Furnimax Will showcase five of the new models from the originals collection along with seven of the best sounding lines from the brand. Unlike other retailers Furnimax Carry stock of selected lines that are on display so customers don’t have to wait for delivery and can’t have a sofa or corner suite straightaway. 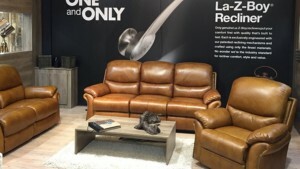 “The point of sale materials for the new La-Z-Boy Furniture Galleries have been in development more than six months and are designed to highlight and draw customers’ attention to the new Originals Collection products,” sales director for lazy boy Dave Darragh said.